Do you appreciate product samples? If you answered "yes" to these questions, you will definitely love The Salad Box. Its the first and only beauty and lifestyle box subscription here in the Philippines. It is the Philippine representative in the beauty sampling industry. Perhaps you're familiar with this service that has become popular all over the world. The idea is quite simple. Each subscription entitles the subscriber to receive a monthly assortment of beauty products in miniature or full sizes from various beauty and lifestyle brands worldwide, that you can try at the convenience of your home. What makes this interesting is that as a subscriber, you will not know what you will get each month. But don't worry, the items will be in accordance to your beauty profile that you provided when you sign up for a subscription. I was excited to receive my first Salad Box and it came with a beautiful and sturdy package that actually reminded me of the Tiffany box, only bigger. Before I go any further, I'd like to mention how impressed I was with how they named this service. It is in fact, a salad of beauty products! Each box comes with a description for each of the beauty product found in it. I received 4 items on my first Salad Box -- (1) a full size Natura Cosmetics Gorgeous! Argan Cheek and Lip Silk, (2) a full size Camaru Naturals Bamboo Charcoal Clarifying Soap, (3) a full size HotShop Our Femme and (4) a travel size BC Fragrance Pillow Mist in Relaxing Mint. The description card includes the price for reference that I really appreciate. The cost has always been a common question for shoppers and I find it a hassle to ask. I find it convenient that Salad Box made the cost of each beauty and lifestyle product readily available. This will actually make it easier for clients to decide whether or not to purchase. Okay, so how does this service work? Visit the SaladBox website and create an account. Choose your subscription plan (monthly, 6 months, yearly, or 6 months prepaid). Do not forget to accomplish your beauty profile. This will be the basis for Salad Box to handpick the beauty products that would be sent to you. The sample products will be delivered the address you provided upon subscribing. You will be receiving 4 to 5 items from different high-end beauty and lifestyle brands worldwide. You may receive upcoming or new beauty products based on your beauty profile. Sample the items at your convenience. Shop for the full size versions your preferred items at the Salad Box site. They accept payments via PayPal, credit card, Globe GCash, or use your Salad Leaves. Salad Leaves are points or rewards that a subscriber receive after submitting a product review, for a successful referral, or earned from previous full-sized purchases. The cost of monthly subscription is Php500. The longer your subscription plan, the higher the discount or savings. 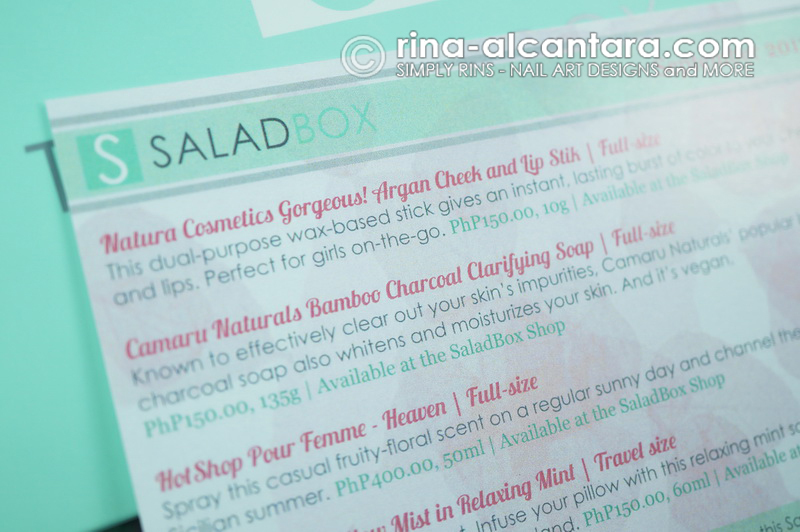 Salad Box promises to give you beauty and lifestyle samples of more than Php700 in value every month just because they value their customers. I think that is admirable. The Salad Box is like a box of chocolates, you'll never know what you'll going to get. But you can always expect something amazing when you open it. From what I got, I am loving the pillow mist and the vegan clarifying soap. The former is a lifestyle product that you spray on your pillow. The mint scent is actually quite relaxing and really helped me sleep better. I'll be bringing this to my next out-of-town trip! I like the latter mainly because it is vegan and is gentle on my highly sensitive skin. I better submit these product reviews to earn some Salad Leaves for future orders! 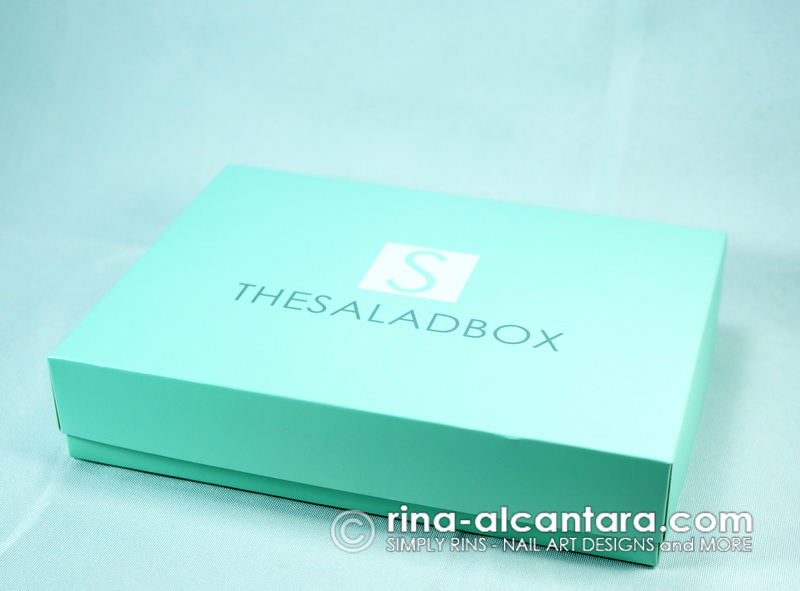 The Salad Box is continuously in search of worthwhile beauty and lifestyle brand partners to give its subscribers a more diverse sampling experience. What do you think? Are you willing to subscribe and receive beauty samples? Disclosure: Item was sent to me for consideration. In no way did it affect this review. Now I'm thinking of I should Salad Box too. Or maybe BDJ? Or Glamour Box? Ahhh! Hahaha.